When we moved into our house a few years back, we had two hot pink couches and a mattress on the floor. That's about the time I began finding old thrift store furniture and painting it...and out of necessity, a hobby was born. Now three years later, I've painted and repurposed tons of furniture, and my entire house is furnished with my finds. This aqua blue dresser is one of my favorites. Enjoy! Last week some friends were moving and they gave me a bunch of furniture from their basement. It was some pretty dated stuff, but I knew I could up update with paint. The pieces were laminate, which usually isn't ideal, but I get tons of questions about how to paint laminate furniture, and I knew this would be a great chance to talk about it. So, here we go. 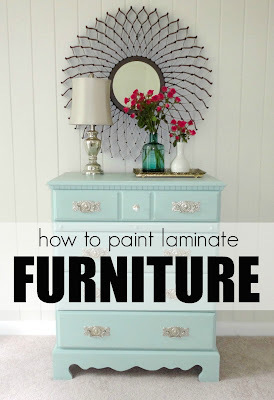 This is how to paint laminate furniture. I paint the majority of my real wood pieces this way, too, so it really works for just about any sort of wood furniture. So, here is the trailer full of free furniture I brought home. (although I eventually painted the larger one, too). The dresser was in great shape, and was a perfect paint candidate. After just a couple hours of work, this is what I ended up with. I think it's my favorite paint project. Or at least a good rival to my all-time favorite. It's hard to compete with that one. So let's talk about the actual process of painting. One of the most common questions I get about painting laminate furniture is if it should be sanded first. In my experience, no. Sanding laminate furniture can damage the laminate and basically ruin the piece. So, be careful. Rather than sanding the laminate, all you have to do to get the paint to adhere correctly is prime. 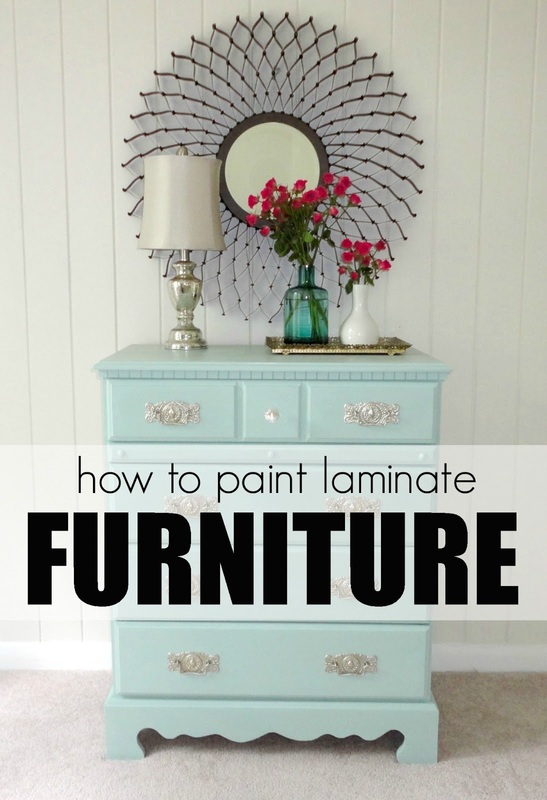 The reason you should prime your laminate furniture first before painting is simple. Laminate has a shiny finish and if you just try to paint directly on it, the paint will not adhere well and you'll visibly see the paint bubble up as soon as you apply it. I've made this mistake before, and it's a sad moment. The solution is primer. Primer will adhere to the laminate, and it will create a surface that your paint can adhere to. It will keep your paint from scratching or peeling off, it will cover up the wood stain, and it will even cover up that musty smell old furniture tends to have. Basically, primer is awesome. The primer I usually use is Zinsser primer (affiliate link). I've also used Kilz, and it works really well, too. Just look for a primer that says it's good for adhesion. Once you allow your primer to dry (You probably only need to wait a couple hours, but I let it dry overnight. ), it's time to paint the dresser. I was able to do the entire dresser with one small $3 sample of Behr flat paint in Marina Isle. It's one of my favorite paint colors. 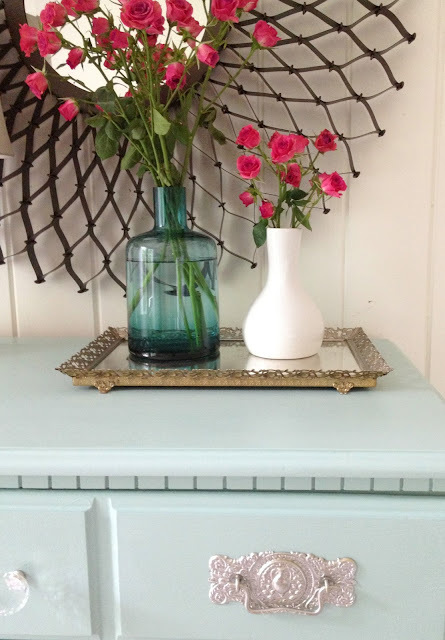 It looks amazing on furniture and is the perfect little aqua. To apply the paint you'll need an angled paintbrush and a small foam roller. I use the angled paintbrush to get into all the crevices and corners, and then I smooth everything with the small foam roller as I go, getting rid of any brushmarks. This will give you a flawless, factory-like, smooth finish. I did 2 coats, allowing it to fully dry between coats. I put a tarp on my bedroom floor and painted it right there. I'm a ridiculous person and I do not recommend this. Once your paint has dried, it's time to seal it. This is the last step. I knew this dresser would be getting a lot of use and I needed it to be durable. 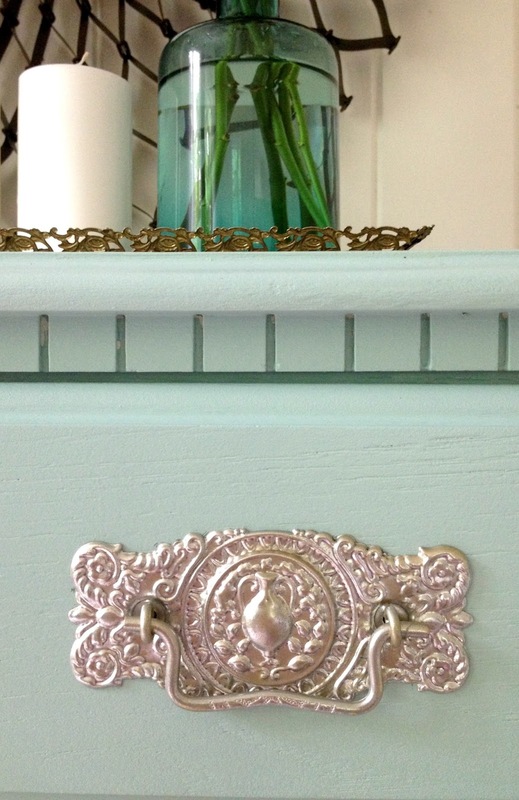 So rather than wax it like I do to my chalk paint pieces (like this one), I decided to use polycrylic. If you need your paint job to be durable, go with polycrylic (affiliate link). Polycrylic is great because it's durable like Polyurethane, but it doesn't yellow over time and it's really low-odor. To apply your polycrylic, just brush it on with a high quality paint brush. I did 2 coats, allowing it to dry for several hours in between. If you can see any brushmarks, you can sand lightly with fine grit sand paper once the polycrylic is dry. After the dresser was fully cured (about 24 hours), it was time to change the hardware. Changing the hardware is one of the best ways to update old furniture. Although the old hardware wasn't bad, and could have been easily updated with a coat of silver or ORB spray paint (seen here), I decided to try something new. After finishing up my kitchen cabinets and being thrilled with the hardware from D. Lawless, I was browsing their store and found that they had an amazing selection of antique restoration hardware. I had been looking for something like this for a really long time, and was so excited. It took me forever to decide, too, because there were tons to choose from. I eventually chose the stamped solid embellished brass bail pull. These pulls were only $3.45. The pulls were originally brass, but I wanted to spray paint them silver. 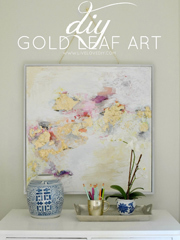 The gold pull looked really chic and reminded me of my favorite kitchen island ever, but it just looked off when combined with the other furniture in the room. So, ultimately, I decided to spray paint the hardware. I'm happy with the way it turned out after spray painting the hardware, and it feels like it just fits in with the rest of the bedroom. A few hardware spray painting tips: Since I didn't want the pulls to be bright chrome, I decided to layer some spray paints. 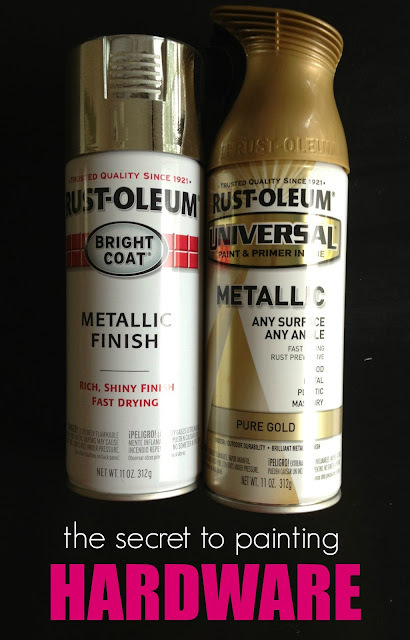 I sprayed the hardware first with the Rust-Oleum Bright Coat Chrome and then gave it a really fine misting with the Rust-Oleum Universal Pure Gold (affiliate links). I love the result. It ended up being a really pretty pewter, and because it has some dimension to it, it doesn't look so spray painted. Here's a closeup of the hardware after being spray painted. To finish everything, I added a few thrift store finds to the top of the dresser. And whatever the cheapest flowers were at Kroger. I found the starburst mirror at Costco for $20. It was originally an outdoor mirror, but whatever. And that, friends, is the story of the blue dresser/how to paint laminate furniture! Thanks so much for being here. 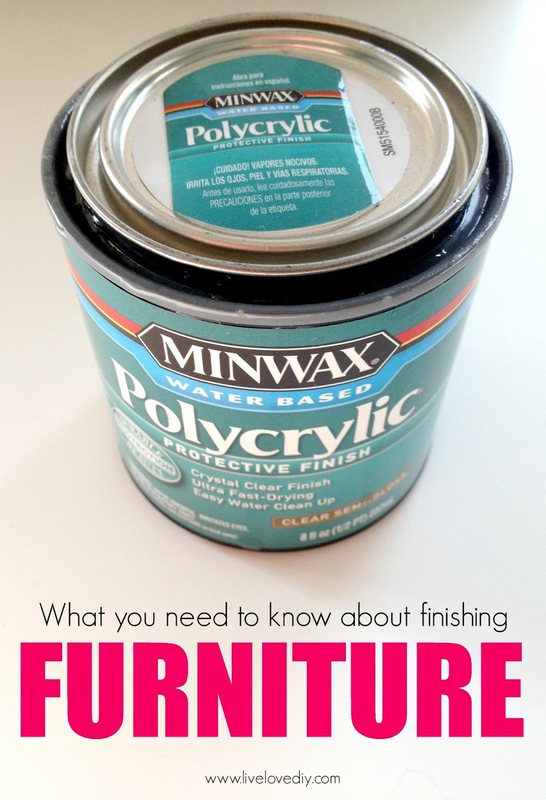 or this post where I answer your top 5 furniture paint questions! 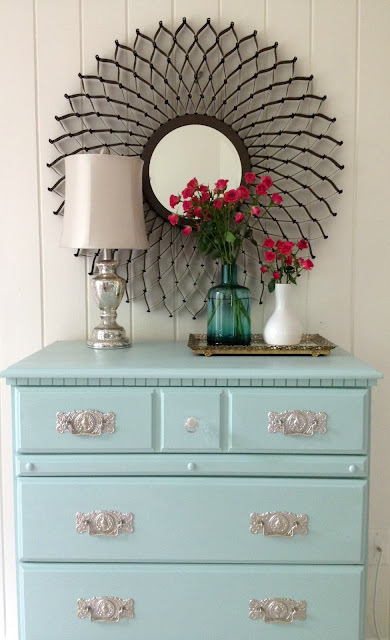 Love the dresser, love the paint colour, ADORE that mirror!!!! what a pretty vignette. Great job & thanks for the tips! Thanks so much Anne! The mirror is adored by moi, too! :) Oh, and what on earth is rubberwood? Looks like I have something new to discover! This is all so beautiful, I too love the colour you painted the dresser and how you changed the brass pulls...awesome! Thank you for a super tutorial, I'm going to try it! Oh, that's awesome Raylene! You totally should try it! Thanks so much for stopping by!! That is amazing! I LOVE that paint color - and the hardware just seals the deal! Love it! I just found your blog and LOVE all your tips. I am just about to embark on my first furniture painting journey... I'm in Australia though, so we don't have all the same brands you do. What sort of paint do you use? Is it just a wall paint? Or a special furniture paint? I just used flat interior paint...nothing special! As long as you prime first and seal afterwards, a basic flat acrylic paint works just fine! Hope that helps!! Thanks for all your sweet words! I LOVE that color! I am going to re-finish a small side-table I found for free on Craigslist in that color! I love this! Thanks for the tips! About to dive into a huge buffet with laminate sides! Yay! That will make for a gorgeous buffet! So glad I could help! Thanks so much for stopping by, Laura! Great tutorial. I haven't tried painting furniture yet, but I have been keeping my eyes open for a piece to try it out on. Love it so much! That color is gorgeous, I may steal it for a future project! Those pulls are amazing and really pull it all together! Looks amazing Virginia! Naturally, I love the color you color you chose ;) I can't wait to see what you do with the other pieces! Yay! So glad you love it, girl!! It's nowhere NEAR as gorgeous as your island I love so much....but it was definitely my inspiration! Next up, start working on the closet!! Muah! thanks for the update - I have a laminate dresser and 2 bedside tables that I got at Ikea forever ago and am so looking forward to giving them an update when we move to our new home! Thank you so much for the ideas and the steps involved. Aw, thank YOU, Stacy! You are so sweet! 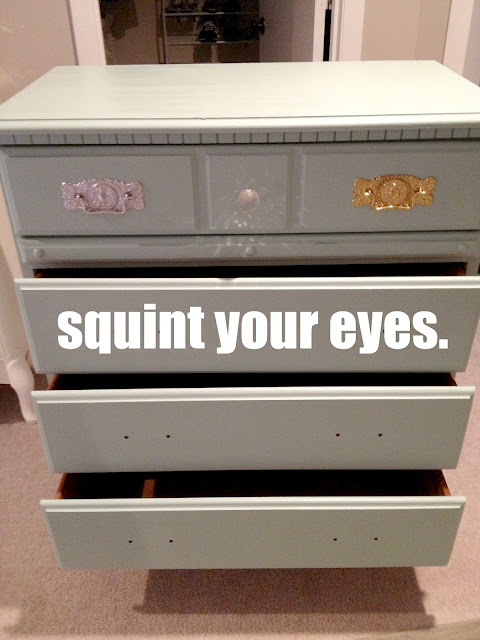 I am so excited for you to update your dresser and tables....you will love what a great difference it makes! Anna, thank you so much for saying that! That truly makes me so happy! Congratulations on moving into your first home! That is such an exciting time! Hi Virginia! Do you think primer+chalk paint would work on laminate? Are there any issues with using polycrylic (instead of wax) on calk paint? Thanks so much for the tutorial!! I was wondering if you have any tips on how to paint over water stained laminate? I know you said that you cannot really sand over the laminate and since most of the laminate furniture is made from mdf or a material like that it is easily damaged when a wet cup is set ontop of it :( soo i was wondering if you had any tips on how to go about covering the water stains on this kind of furniture?! This is a spectacular entry!! What a beautiful result. I love that you mixed colors to paint the hardware, it came out beautifully! truly beautiful finished piece.....i must say: YOU GIVE THE MOST AMAZING INSTRUCTIONS. THANK YOU THANK YOU THANK YOU. I HAVE LAMINATE PIECES I'VE BEEN EAGER TO PAINT. THANKS TO YOU I CAN. I have a laminate dresser that has bubbled on the top. How do I deal with that? The rest is in excellent condition. Absolutely gorgeous! Love this post and love the blog. :) I have some laminate built-in cabinets in my bathroom that I'm dying to paint...do you think this technique would work there? Thank you! Love the color! Looks amazing! Great tips. Fabulous! I painted our son's (who is waiting for us in an orphanage in India) dresser that was part laminate. Primed it, painted it with a few coats but couldn't get the red color just right so I finished it up with spray paint and it's perfect. Do I need to use polycrylic it too? Have you ever used primer from a spray can? I'm just wondering how it adheres compared to the kind you would roll on. I guess I would also need to pay attention to whether or not its oil based or water based? Looks beautiful! I use a lot of the same products when painting furniture-they sure do the trick! 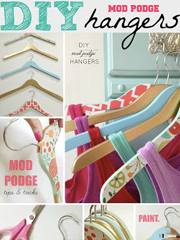 As a fellow thrifter and DIYer I just love reading your blog...thanks for sharing! So gorgeous! I just discovered your blog as I am getting ready to move into a house after 20 years of condo living! You're helping me get geared-up! I think I will refo my childhood bedroom set in this color for my daughter-- thanks for he inspiration! Hey you are awesome. Just wanted to know if its fine to use the same brush for the primer, paint and finish? Of course after washing each time. Plus what kind of brush would you recommend? Its quite confusing. Mohair? Make sure to read the entire post above though, please! I recommend using a mini foam roller over your brushstrokes to even them out. Could this work on the cheap book shelves from Target/Walmart that are press-board? I really don't want to have to buy new book shelves, but they currently look like something from my old college apartment. It should work just fine as long as you prime first! I was just wondering because I have picked up 2 discarded mostly laminent wood pieces of furniture. There are scratches on them not deep but enough to make it very unapealing to the eye. What would i do, since I read that you said you cant sand laminent furniture and would ruin it. Please help I really dont want to find out I cant redo them . Hi April! I would use Elmer's Wood Filler on the scratches and then sand it even with the wood after it dries. You can sand it lightly and it will be fine. You just can't sand it like you would a normal piece of wood. Hope that helps! I just found your blog while googling about painting a dresser. I'm so glad I did! Thanks for the tips! Can you use semi-gloss paint instead of flat paint? I've already primed my furniture with 2 coats of primer and now I'm ready to paint but I only have semi-gloss in the shade I want to use. You sure can! I've painted many pieces just by priming and then using semi-gloss. I don't usually use a topcoat with semi gloss paint, as it creates a nice finish. Hope that helps! The paint I have says "Paint and Primer in one." Do I still need to use primer? Or is that sufficient? I'm giddy as if a celebrity has acknowledged me. Hey girl, I totally think that turquoise end table brings out your eyes. HA!!!!!! Well, I'm about to acknowledge you twice...because you are just THAT awesome! (And also.......I am about the farthest thing from a celebrity possible. But, thanks for putting some wind in my sails anyways!) MUAH! I just wanted you to know that I love your blog! I tried painting a wood laminate dresser for the first time (my daughters huge dresser) and it turned out wonderfully! The style was very feminine for being such a large piece but the wood just gave it an ugly outdated look. I have been struggling with painting it or not but after reading up on some of your projects it gave me the confidence to give it a shot and now I'm kicking myself for not doing it sooner! I can't wait to paint more pieces and get to work on some more home improvement projects in my 1940's home that have been intimidating me. Thank you so much! That's SO awesome, Melinda! I appreciate your sweet comment so much! Thank you! I am preparing to paint a dresser that is similar to this, my drawers are wood and the sides and top are laminate. Did you sand your drawers at all-or just put primer on everything and painted. Also, I'm going to distress it- do I wait after I distress it to apply the top coat? Clever, thrifty and a great result. Thanks for sharing. 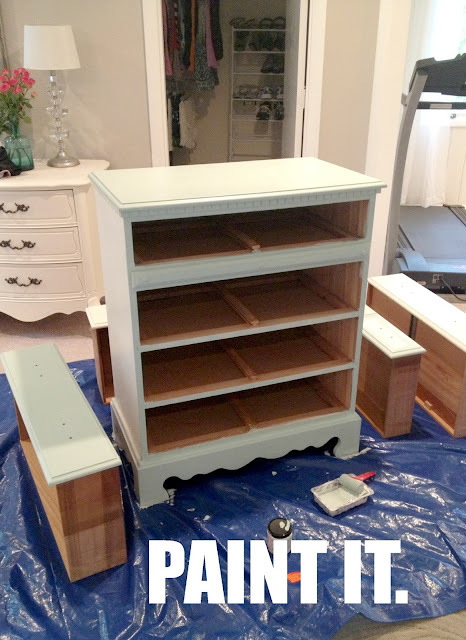 Did you use this same process to paint your kitchen cabinets? Mine look exactly like your before picture and I would love to get them to that nice clean fresh look, but I'm not sure where to start. I have a cabinet that is laminate and has a few scratches. Is there a way to fill that in or am I stuck with them? HI there! Yes, try wood filler, then let it dry and sand it afterwards. That should work nicely. Did you sand the polycrylic? Thanks so much!!! Beautiful turn out! I have been encouraged by your post! I work for a non-profit and people donate their used furniture to us to sell so we can run our program. We usually sell stuff so cheap because it always that particle board boring brown stuff. I really want to play around with some things now and see if I can change it and still make a profit for our program! I feel so energetic, I can't wait!!! OMG! OMG! I cant stop reading your blog ever since I discovered it last evening. 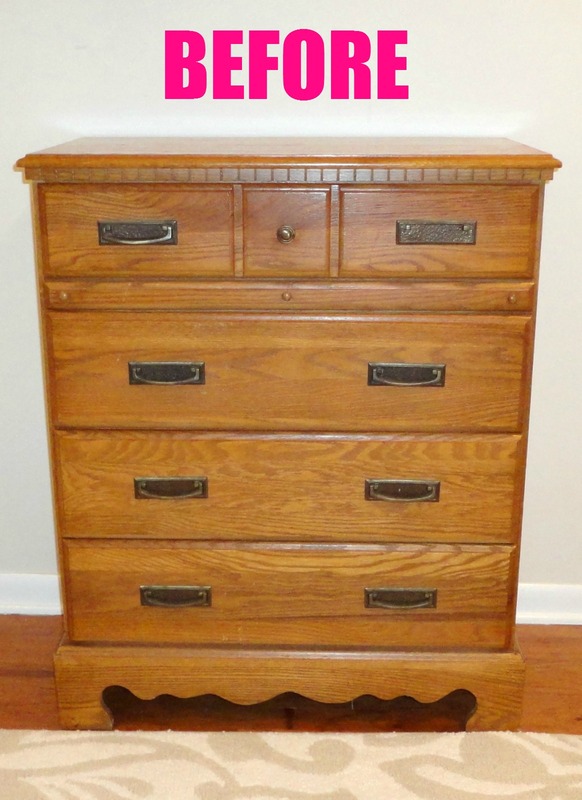 I was googling about painting my old laminate, similar chest, which I found in Goodwill (Thrift store in Toronto). You are amazing. thanks for all the details and picture. I am doing it this weekend. Thank you so much! Good luck on your project!! I agree!! This is quite amazing! You totally made the right decision of changing the hardware to pewter!! LOVE IT! Thanks for the info! This is absolutely amazing!!! I love it! How many coats of primer did you apply? YOU! My dear...are the reason I opted to paint my ancient (slight exaggeration) dining table and chairs. ;-) I started yesterday, so wish me luck. I originally just wanted to buy a new set but after reading this... I KNOW I can do this! Thanks, you are saving me lots of money! oh! almost forgot, quick question...? Did u sand between coats for the polycrylic? Hi there! Yes, I do sand between coats. It should help to get rid of any brushstrokes in the topcoat. Thanks so much for your sweet words! Oh no! I'm so sorry that happened, Demree! I've had that happen before on a dresser and it was so frustrating! After a little trial and error, I've found that using those inexpensive foam brushes to apply the polycrylic works best. These days, I apply one coat with the foam brush, let it cure for a few hours, sand it with fine grit sand paper, and then repeat that process with another coat or two of polycrylic. Since you've already done the polycrylic coat, I would just go sand it and add your next coat with the foam brush. Let me know how it turns out! hi and thank you so much for the Step by Step. Gorgeous piece and great instructions and links. Question - does the primer step have a smell? i know you said you threw a tarp down and painted, but i'm not sure if that included the primer step ? i have a small place with no garage unfortunately.... Thank you very much for the scoop on this point! Seriously this is my new favorite blog. I love how detailed all your tutorials are. Your house is BEAUTIFUL! I'm working on a dresser right now that will be also used as a changing table, and I was wondering what finish you would recommend for it. I don't want it to be too shiny yet I want it to be easy to wipe down. Also does the finish smell? The dresser is in my living room since I've been working on it late at night, so I'm wondering if I should move it into the garage before finishing it. Thank you!! Can you skip the primer if you're using a paint that has primer added? LOVE IT!!! Im from Canada, but ordered the same hardware and am so excited to spray paint them and then add them to my daughters newly glitter painted bedroom suite!!! Thank you!!!! I love your blogs, your honesty, tips, mistakes...love it all!! For any of us who have more time and creativity than budget know, it is all in the paint and finding the right pieces to work with. 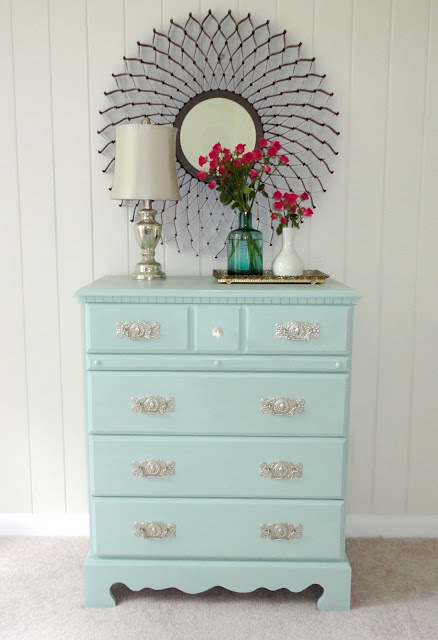 Paint is my best friend and on a normal day taking the kids to some lesson or other, I came across a smallish 6 drawer dresser perfect for my very french shabby chic guest bedroom. It was $5 and for the first time I am taking on laminate. My instinct was to lightly sand to give it "tooth" for priming, but decided to Google and found your delightful site! I now have all the paints, primers, painting tape and did my before picture which included stickers all over the drawers. I need a statement piece in this room of pinks, greens, whites and little bits of yellows, so I am painting 6" yellow and white stripes on the dresser top, yellow on the sides and using fleur de lis pale yellow stamps, slightly sanded for age on the alternating yellow and white drawers. I am SO thankful I found your site and didn't sand as my "month in the mind dream dresser" plans would have been junk! Can't wait for the "after" picture and the dresser that my mom-in-law will appreciate the most; both for its look and its practicality. Thanks. Thanks. Thanks. Keep painting!!! I'm so sorry you are having a difficult time. It's likely due to your primer.I would allow a few more days for the oil based primer to fully cure and then paint it with oil based paint. If you choose to redo it with water based primer, make sure you use water based paint over top of the primer. Water based products are what I use and they dry quicker and are much easier to use. They don't smell either! :) Hope that helps! I love all of your diy tips!! I can't wait to start my projects now that I have some guidance from you. Me and my new family have a similar story. We have just bought our dream home and we are now short on cash to furnish it. We have old bedroom furniture that needs some help, big time. I do have a question: Our furniture is laminate and old, on a side table there is a raised spot where the "wood" has lifted due to water damage (my wonderful husband left a glass of iced water on it too long without wiping dry) and I was wondering if you knew a way to fix it? I know cant sand it so I am at a loss as to what to do. Great tips! I have my eye on an Ikea wardrobe and LOVE the high gloss doors, but they add an extra $130 over the regular (laminate) flat white doors. If all these steps are necessary to go from flat white to high gloss white, I'm game since it would still be a significant cost savings, but based on all the ideas in the comments, maybe that's not necessary. A white gloss rustoleum spray for plastics maybe? Or clear gloss polycrylic on its own? Would love to hear your thoughts, but I'm saving this post either way! Hi Virginia. I love your blog! I was wondering if you think this method of painting laminate would work with a kitchen table? The top of my kitchen table is laminate bute the rest is wood. Would just priming it and painting it last? I am so glad I stumbled across this. I just bought a credenza that I THOUGHT was wood, but was not...it was laminate. We were planning on sanding and you literally saved the day! NEW FAN!! thank you for such easy instructions and illustrations as well! You have totally inspired me. I spent yesterday painting an old media console I bought in the 90's - not laminate but veneered and beaten to heck after 10 years, 3 children, 4 cats, 4 dogs, and 5 living rooms. I thrifted a barrister's shelf for its spot in the living room (my TV is mounted on the wall, so I don't really need a console any longer.) I am thinking it will live in the foyer next to my bedroom door and will host a thrifted pitcher and basin set. My next project is my kitchen table, chairs, and hutch. The hutch and table ARE laminate-topped. Wish me luck! I've also become addicted to spray painting. Thanks, Virginia! Will any primer work for this project or do certain ones adhere better than others? I've just discovered your blog, and I've fallen hard. Totally bookmarking this for all of my furniture updating and DIY inspiration, thank you for this ace post!! I just found your blog and have been reading it for HOURS!! You're my new heroine - I anticipate saving time and $$$ following your tips. Here's my issue: would you suggest trying to paint laminate kitchen countertops? I need to upgrade the look of my home, and I'm wondering if I can use a chalk paint to mimic slate countertops? Thoughts? Hi Nancy! Thank you so much! Here are several links to products that can be used to paint countertops. I would look into one of those first! Hope that helps! What did you spray the lamp with? Is it Titanium Sliver? 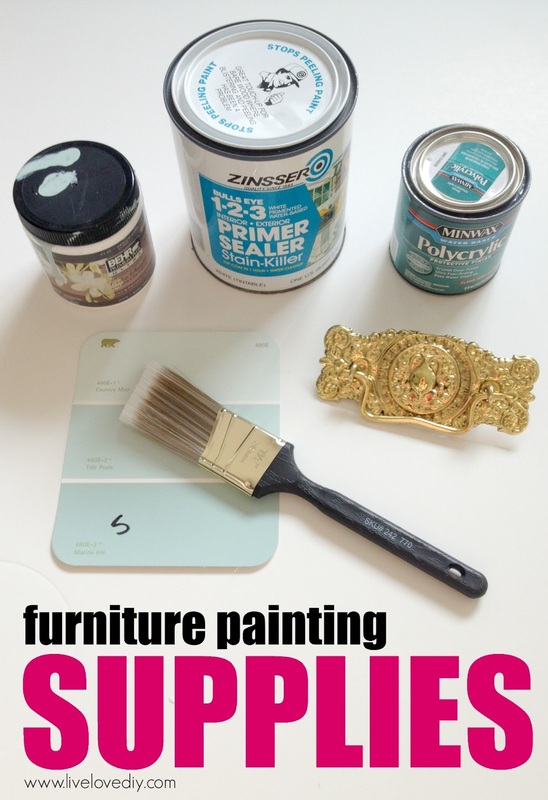 I can't wait to try and paint some furniture turquoise in the next few weeks! Is there a need to sand the wood first if you are going to use primer on a piece that is wood and laminate? Love your blog and am painting everything I can get my hands on!!! I found a wood kids bedroom set with laminated top and sides.Its white washed in color but has multiple areas where the laminate was peeled off the top edges and it has an ugly brown cheap looking material showing through on these areas.Can this be fixed? Hi Virginia, I am currently a makeover to my bedside tables following these steps of your post "How to paint laminate furniture". I'm at doing the coat of polycrylic tonight. Question: Do you only put it on with a brush or do you use the foam as well? Hi Emma! I apply with a brush and sand with fine grit sandpaper in between coats (once it's dry). Fabulous tutorial, will definitely be using this. Our son's nursery is Marina Isle trimmed with white, beautiful color choice!! This is awesome wish I would have found this before I messed up my daughters night stand. Question for the paint color. Do you always use a flat paint? Is it better? Or do you use the flat paint because the polycrylic gives it the shine look? You are a freakin' genius. So happy I found your blog. thanks for these wonderful tutorials.. i'm using this to paint an old dresser to use for storage in my new sewing/craft room.. 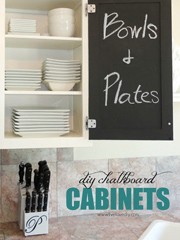 I am also re-painting my horrible kitchen cabinets using your tutorial.. it seemed impossible to do myself until i found you... thank you so much for helping me see i can do this myself.. I just came across your blog, and I wanted to thank you. I've been looking for ideas and tips since I'm redecorating my apartment, and your posts are exactly what I'm looking for. Great unique ideas! Would this work on something like particle board ikea furniture, too? I love my little cubicle organizer, but it's a dark brown to match my current room. You've inspired me to switch to white and blues, and I'd love to still use this piece (only a few months use). Thank you so much for the blog! As a college student moving into my first non-furnished place, this has given me hope and inspiration that I can decorate on a budget with a little TLC! Thank you!! I actually took your advice on the Rustoleum recommendation and that is fabulous - exactly the look I was going for and now I need to pick up a foam roller to paint my desk. I just have to say I have so enjoyed your tips and tutorials. I love reading and laughing along and learning. You have made DIY seem less daunting. I didnt think I could do it but I have made a few things that I am proud of. Thanks!! I have been asked to do a refab on a laminate dresser for a nursery. In my research I came across your blog....can't thank you enough for all the helpful tips! One question though...the dresser I'm working on has a few light scratches that I don't want to show through the paint...how would you go about fixing these before you prime? Thanks! Hi Sean! You can fill any scratches or dents with wood filler. Just apply a small amount and sand it with fine grit sandpaper once it's dry. Then you can just prime and paint over it and it will look good as new! I'm so excited about this post!! When I got married 9 years ago, the furniture my mom surprised me with in high school came with me. I never liked the furniture, but it was a lovely gesture and I've never had the heart (or money) to part with it. We're moving at the end of the summer and I've dreamed of a new bedroom suite in the new house. Money-wise, that just might not happen. You've inspired me to paint this furniture and make it new for our new space! Thank you! We were going to put it in my 5 year old daughter's room whenever we got new furniture. I'm excited to maybe even paint it purple for her. 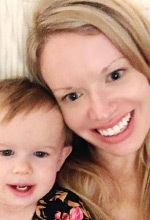 Jessica, how about using white paint for your daughter's furniture as Virginia has done and use purple as accent in your accessories or even wall color. Seems like it would be easier and less laboring to change accessorties then to have to repaint a bedroom suite again as she gets orlder. Just my 2 cents. Virginia, I thought some furniture items looked familiar and when I took the tour of your bedroom, saw the before picture and after, I remembered I found your beautiful blog earlier this year and commented on it. You've come a long way, baby! Your bedroom is so beautiful and serene looking yet so elegant! God gave you a special gift and you are certainly using it. I just love what you did with that dresser! I've been trying to tap back into my crafty side but I'm so worried I might make things look worse instead of better! I have a question about the primer also, do you th ink a spray paint primer would work? What kind should I look for if it did? Also after doing this method do you think I could distress it to add some character or would it not come out right? Any advice is helpful thank you and your such an inspiration! I just love seeing the projects you've done, you're such an inspiration! I used to do crafts all the time but after going through some hard times and after having my first child got into the whole laying around with my sweatpants and hiding thing. Now my family has just moved and I'm ready to start tapping into my "craftyness" again lol. I am wondering if you could help me with a few things. I was wondering if a spray paint primer would work instead or if it would be better to do pain't primer like you did? Also if I did do a spray paint primer would I still be able to sand it if necessary? Any and all advice is most welcome, thank you for doing this blog! I now have ideas for projects that can help give me something productive to do!!! Hi Alicia. If you use a spray paint primer (usually oil based), I would make sure to use a spray paint over top (also oil based). But, yes, that would work, although it might be expensive if you are painting a large piece. You can sand the primer if you need to with a very fine grit sandpaper. Hope that helps! We just scored a couple of (free!) tall, deep bookshelves that are cheap veneer. I want to paint them white to use in my kitchen (I have no pantry), but they have plastic trim which add to their charm. Should I use spray paint on that? How do you recommend I approach them? There's some deep carving-like detailing. Thank you so much for posting this!! I regularly shop the thrift shops. You gave me courage to tackle some projects! 1. The dresser is black wood from ikea, how do i paint it white? 2. I do not want to spend a lot of money, so how do I sand it without using the sanding machine you have? I love this post. You have just saved me a ton of trouble and fishing the internet for how to redo this roll top desk I'm rehabbing for my mom. I bought it and was told it was solid wood. Sure heavy enough to be but alas it was MDF with laminate Figured that out as I had to peel some laminate off :( I now can get started on it much sooner than I thought thanks to you. I'm also a sucker for free or cheap furniture to rehab. I've done a set of bunk beds and dresser for my kids so far and have the roll top desk with a chair and a dresser lined up. Can't wait! Does it matter whether I do 1 or 2 coats of primer? Can I use a paint roller for the Polycrylic, or would a brush be better? Hi Chasity! 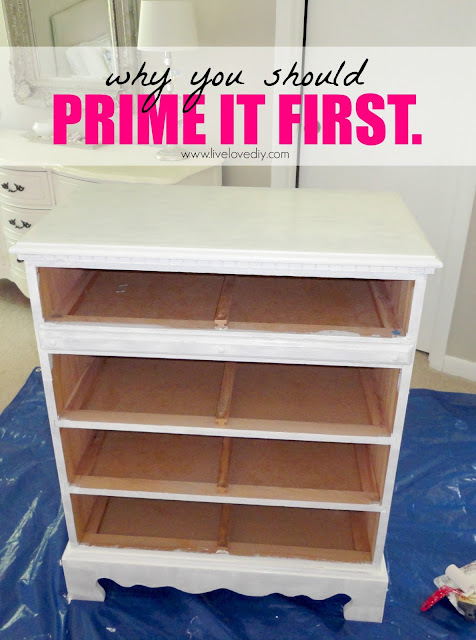 I usually just do one coat of primer, but if you notice that the stain is seeping through the primer after the first coat dries, it might be best to do two. Also, I would definitely use a brush for the Polycrylic, as the roller makes it bubble up. Hope that helps! I love this! Do you recommend using a primer based paint instead or primer then paint? Hi Megan! In my experience, the primer plus paint in one doesn't work as well on furniture as just using a separate primer and then paint. Hope that helps! Thanks for this tutorial! I finished my side table today and I absolutely love it! I can't wait to finish the rest of my bedroom set. Thanks again :) I didn't have as much patience to wait for hours for paint to dry but I'm happy it didn't ruin the project. Love this! Great tips about painting laminate! I tried it on a bedside table I did a few weeks ago and the project turned out really well! Thanks again! Is painting laminate furniture the same as painting formica? I tried the same technique on my kitchen cabinet doors which are formica, some are fine but others have chips taken out of them. I primed, painted and protected but still chips. Any advise? Okay, I specifically came back to your blog and found this post, which I first saw on pinterest (which led me to your blog to begin with) because I was mesmerized by it, and because of one thing. That mirror only cost $22!!!!! That is incredible!!!! I was in a kind of outlet store, and saw one just like it for $100. I'm amazed and will be hitting up Costco for finds like that! Initially, I was looking at how to redo my dresser, which I am doing, and have been helped by your information!! I totally got wrapped up in these posts though. I have my own little miniature start up blog, which is more about everything (hopefully has a little a humor, and is not just design), which I'm trying to build. I could literally lose endless Saturdays with your posts though. Quick question...when you go over your brushed on coat with the foam roller, are you adding paint to the foam roller? Or are you just using a dry foam roller to smooth out the brush strokes? 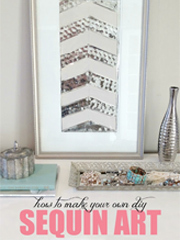 Great DIY tips & project, thanks for sharing!!! This is beautiful! I am so glad to find your site. Question: How long should I wait after painting to put the clear coat on? That paint color looks so beautiful, light and bight in you pics! It's exactly the color I'm looking for to paint furniture for our nursery but when I looked at the sample card it seems so dark! Does the paint photograph lighter than it actually is? I love your blog! When applying the primer did you use a brush or roller? I was reading your blog and came across that adorable, antique mirrored perfume tray on your dresser. I'm dying because I have the EXACT same one! ha ha ha! Random that I see the same one on your blog! Where did you get yours? This piece is just gorgeous! Thanks to you and your many many posts on the trial and error of making nice things, I've gotten brave enough to actually do it instead of accumulating bookmarks about doing it! I mean, I'm still hoarding those bookmarks, but they're mine and you can't take them from me. I can't wait to finish the desk I'm working on, so I can show you! You're (in part....big part) responsible for its transformation from ugly brown duckling to beautiful blue swan! Hi...I just found your blog. Thanks for the tips. I also just saw the same rug in your photo of this post, in one of the Fixer Upper episodes. Can you please tell me where I can get this rug? I am one of those who is very particular about rugs, and usually the ones that I like the most, happen to be the most expensive...maybe this one is different :) thanks! Hi Lisa! It's from Home Depot and it was under $100. One of my faves! I was thinking about buying new bedroom draws as the white has gone a funny colour, I asked my husband about repainting them but he said you can't due to them being laminated. Anyway I thought I'd ask goggle and I found your blog. I'm so pleased to say at the least. Thank you I'm over the moon as I'm going to do this and brighten up the bedroom furniture. Many thanks Lisa. PS I love your work! I totally did this myself for a dresser set that I have split in two rooms now. I've had them and hated them frankly for well over 25 years but they were sturdy and I had boys. :-) I love the way they turned out. 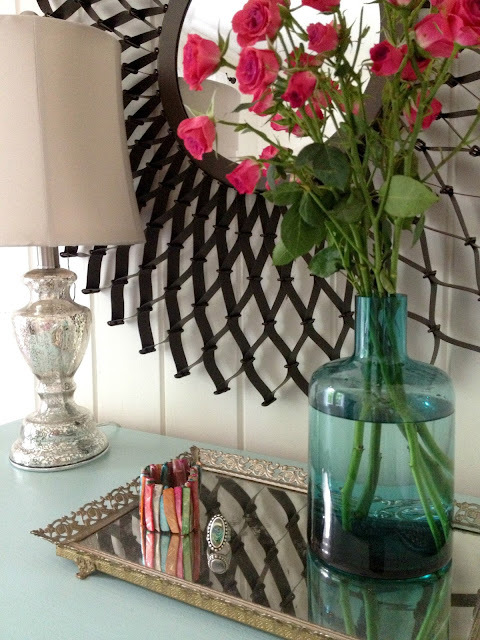 I'm thinking of repainting my walls now and I love the subtle contrast between your dresser and wall. It looks like a light green in the pictures. Do you remember the color name? Its very soothing. Thanks so much for this post! Thank you for sharing all the wonderful pics, ideas and tips. It helps me to get the materials and diy my daughter bedroom which has build-in shelves and cabinet. I used similar aqua color and it turns out superb! Tons of thanks again! (We are in Singapore and it took us some time to find the primer and polycrylic as DIY shops here just carry the basic stuff). This is really helpful! I have a piece that has been sitting in my garage waiting for paint for months! I'm not sure if you already answered this question (so many comments!) but how much primer did you use? The link you have is a quart but in the past I had been told it would take alot more than that. I had actually been putting painting this off because of how expensive I had been lead to believe it would be but after reading this, I'm really excited to get started on it! This was soo helpful! 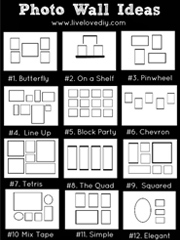 I have a few laminate pieces that I want to update for my kids room. And you also had me cracking up..awesome tips! thanks! We totally have that exact same mirror! Scored it for $20 as well, what a deal! Thanks for all the wonderful tips, I'm about to attempt my first project. Thank you for this wonderful post! I am just getting back into DYI projects and I am about to do an expresso headboard and bookcase. I think I can do this well.....but wish me luck! Love your detailed, step by step instructions. Ready to start now! I discovered you from Christine Kobzeff. I love your blog and really love this post. I am a newlywed as well so I'm really excited for this DIY home projects for my husband and I to try out together. Thank you for sharing. Virginia, Thank you so much for the step by step instructions. I am a brand spanking new furniture painter and it's terrifies me!! I just moved into a new home with my girls and my fiancé (renter white blank canvas ready for my creative decorative flair heehee) with no furniture and a tight budget. I picked up a dresser with wood front and laminate sides. When I applied the primer it would bead up on the edges, I kept at it but eventually had to give it a sanding to make it stick. (What would you have done?) Next I painted 3 coats and then added 1 coat of the Polycrylic you suggested. I let that dry then I painted a glaze on and as I was wiping that off I noticed a couple small areas where the primer was showing through. Ugh!! !